Let us help you achieve your goal. Come to the Canary Islands to enjoy your surfing vacation. 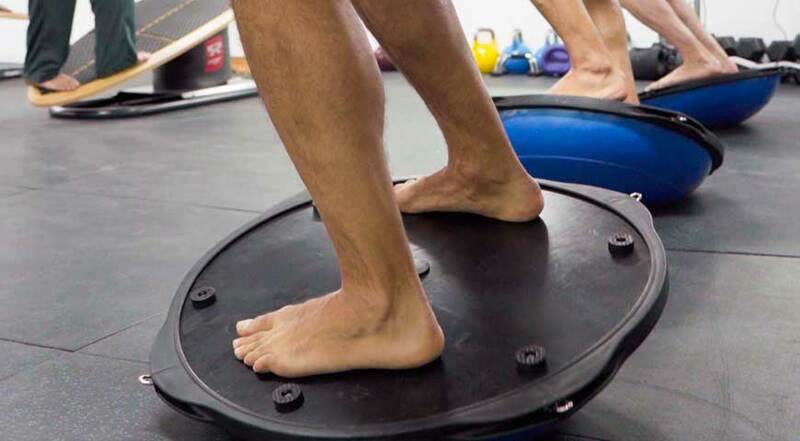 We have a very effective new system to improve your skills faster (Gyroboard and Drysurf system balance). Prepare to learn the unexpected! 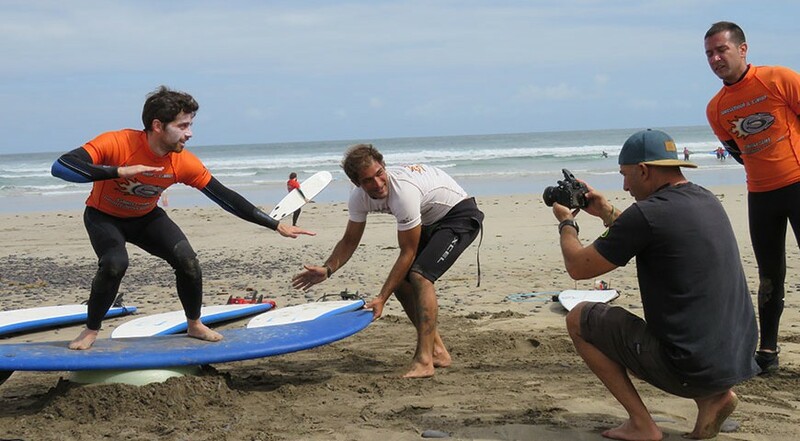 If you already have surfing experience, have completed various courses in different surf schools or have taken part in various surf camps, then we have the ideal course for you. We have designed the “Total Experience” camp with healthy activities for intermediate level surfers with previous experience. If you decide to travel to the Canary Islands, then Lanzarote is the perfect island, here you will find the surf camp that you are looking for; classes for two and a half hours each day, which is more than enough time to take up the sport that you haven´t practiced in a while and if you really are in good physical condition, then we will provide all the material you require during your entire vacation to surf on your own for as long as you desire. In the evenings (17:30hrs to 19:00hrs) various functional exercises will take place which are aimed at improving your surfing skills with the help of our special surf boards; Drysurf System Balance, Gyroboards which will greatly improve your turns with the correct balance, bosus, Slackline, photo analysis with mistake correction, practice of the correct pop up and stance, we will also teach you the correct way to duck dive (this is one of the most problematic moves to master) stretching for flexibility, yoga and much more. 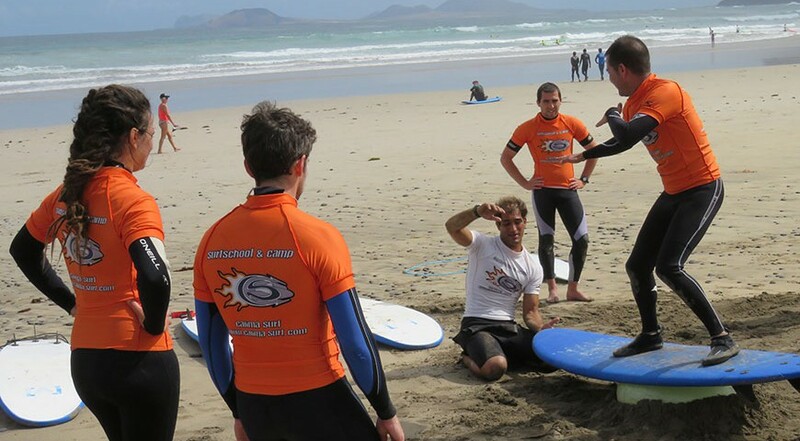 This surfcamp is for intermediate level surfers and is offered throughout the year, courses of 2, 3, 4, 5, 7 or 10 days with accommodation included just 100 meters away from the waves. 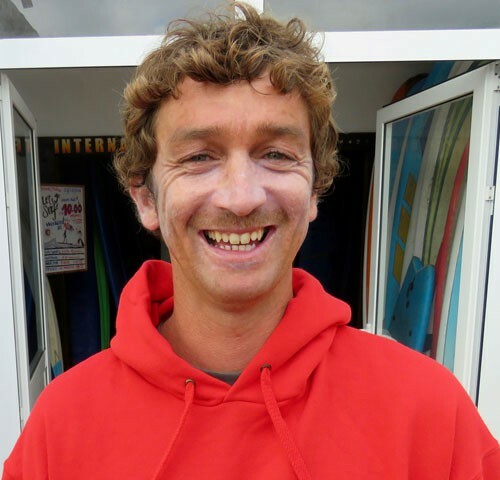 In the mornings, surf classes will be held (10:00hrs to 12:30hrs) There will be a maximum of 8 students per monitor to ensure a safe teaching environment, they are all expert lifeguards and are very familiar with Famara beach. During the evenings (17:30hrs to 19:00hrs) every Monday, Tuesday, Thursday and Fridaywe will go to the private Calima Surf gym, exclusive for our clients. There we will practice different functional exercises aimed to greatly improve your surfing with the latest methods of advanced teaching. We will also do personalized photo analyses with the photos that will be taken throughout the week, you will be able to see and learn from your mistakes and those of your colleagues. We are open all year round, therefor you can come on any day that you desire and start the course the day after your arrival. 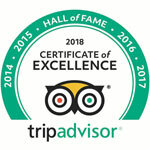 Accommodation at our surfhouse just 100 meters away from Famara beach. Daily cleaning of public areas and change of bed linen, blankets and towels. All the material (epoxy board and wetsuit) you may require to surf on your own after the classes. Transport from the surf school to the beach where the classes will be held. What´s more...all the free material you may require during your vacation to surf on your own, after classes or on weekends! So you can get the most out of your surf vacation. 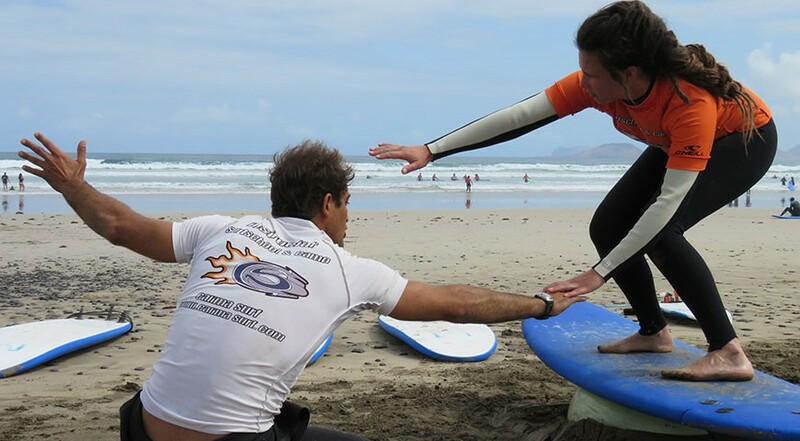 The material must be left at the surf school each day before 6:00 p.m.
Monday: We will start the classes with theory on the tips of the most common mistakes in surfing, which will help us to understand and progress in your surfing from the first day. 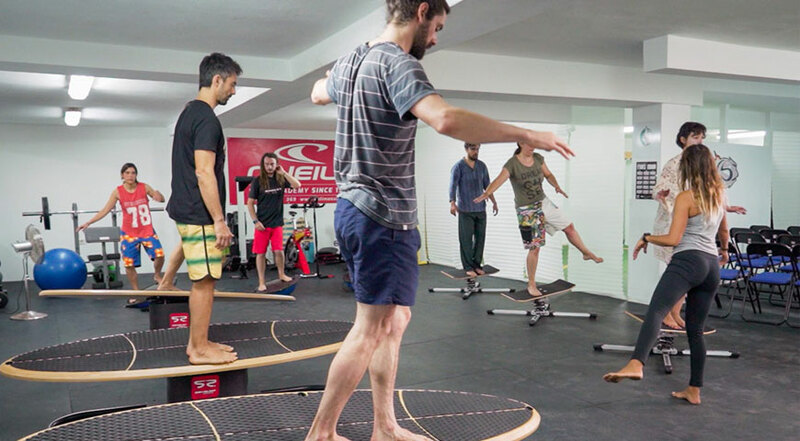 Next we will start with physical activity in our gym, with a series of exercises designed to work to improve your balance and strengthen the core, for this we will use special Drysurf System Balance boards, a great complement to improve surfing. 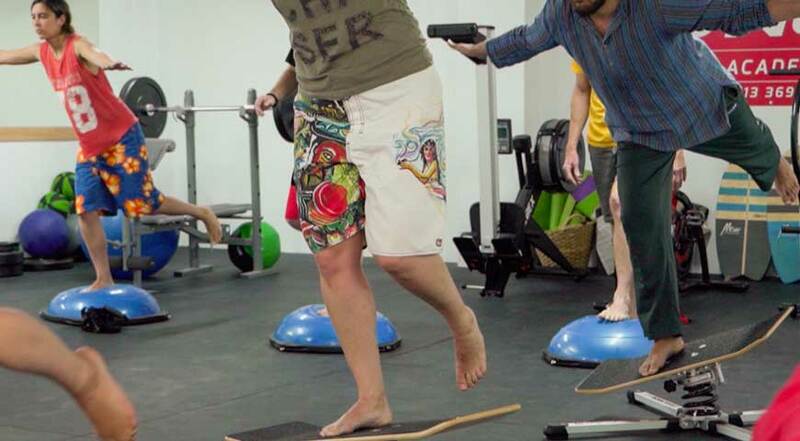 In addition to the Gyroboards, that will help us simulate the turns on a board, TRX and Bosus, will reinforce the take-off, the paddling and finish with a good stretch. Tuesday: We will give theoretical classes in which we will talk about all those factors that affect the waves and the practice of surfing (since we are in a changing environment) that will help you get the most out of your hours in the water. It is essential to know how tides work, the wind, types of bottoms and currents, how waves are formed and interpretation of weather forecast maps, rules of surfing and correct behaviour in the water with other surfers, knowledge and care of the material, differentiation of the different models of boards and know what would be advisable if you wanted to buy one, know how to differentiate the quality of wetsuits (basic sewing, flat seam, sealed seam and integral) you will learn to put wax on the board, when it is necessary to use base wax and the different types of waxes according to the temperature of the water, to comb and clean the board ... In general everything you need to know to continue enjoying and practicing this exciting sport. Thursday: After a few days of learning, and with the photos taken throughout these days, we will make a correction of errors through the photos taken of the whole group. This is a dynamic and fun way to learn, observing both your mistakes and those of your classmates, as well as the details that you do correctly. We will make a personalised photo-analysis and will be able to correct postural errors and timing. We will continue with a little more advanced theory in which beginners, intermediate and advanced students will benefit. How to pass the wave barrier (turtle and duck), how to situate yourself in the line-up, how to catch waves at the peak and "my first surfari "(useful tips to go in search of the waves)? Second class of Dry-surf with a more functional approach, do not forget your sportswear and towel, you will sweat! Friday: Yoga class or stretching for beginners and intermediate, another healthy way to stretch the body through basic postures, here we are going to realise the need of our body to accustom it to a daily stretching routine.